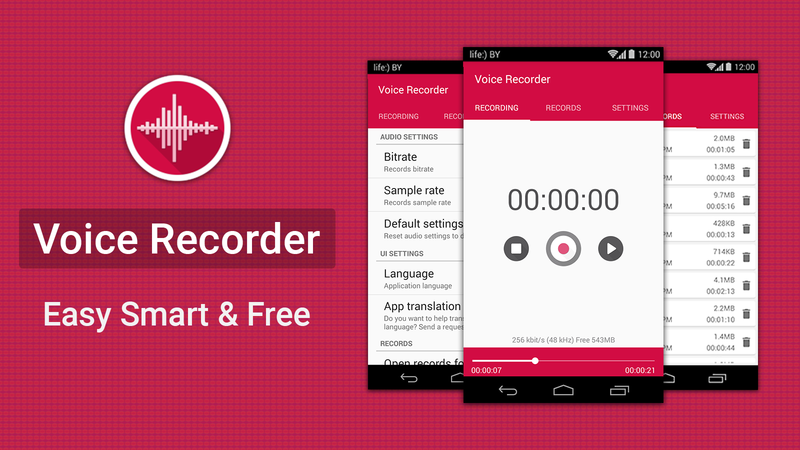 Capture high quality voice recordings on android with these best Voice Recorder App for Android. The one cool thing about your Android smartphone is that it serves as you own little robotic assistant that comes with virtually anywhere you go. In day to day activities you might find that you need to take some voice notes, interview people who have no time to wait for you’re to get your audio equipment ready, or simply record a conversation for security or just for fun. Needless to say, every smartphone comes with an out-of-the-box manufacturer installed voice recorder app to go with the voice recorder hardware on the phone. If you are looking to record quality audio files on your mobile, you might find that the software that the manufacturer installs on your device is not exactly high end or not user-friendly. There are not that many customizable options as you may like and the quality of audio recorded leaves a lot to be desired. This is when downloading certain best free android voice recorder apps for your smartphone become a viable option for you. Even then, you still don’t know which ones are the best and which ones will not be worth your data charges. Some of the best voice recorder apps are actually free to use with in-app purchases. You no longer have to worry about spending too much on voice recorder apps because most of them are quite enough for mall scale recordings. Some other apps allow trying the functionality for free before upgrading to the premium versions of the app. We have put together a list of just seven crème de la crème voice recorder apps, so you get it right the first time rather than fill your memory with poorly programmed slow voice recorder apps that are not worth the name. We have selected the apps carefully from the Google Play Store where it is safe for you to download voice recorder apps without having to watch your six for malicious damaging apps. Grab the following best voice recorder apps and see which android voice recorder app does the job nicely. This app is all about simplicity and dedication to voice recording only functions. You will find it easy to use modern feel interface equally matched by its high-quality audio capture capability while keeping it cool with no clutter and useless features. What is not to love in simplicity and clarity when it comes to audio recording. This makes the app more applicable in the field. For instance, if you are a journalist you do not usually enjoy the luxury of time to configure your phone to start recording. On the free version of this app, you can record high-quality audio in PCM and WAV formats. If you want to record higher quality stereo audio, then you can upgrade to the paid version, but that might not be necessary since the free app is so awesome. The smart voice recorder is one of the most clever voice recorder apps ever made. It can record night noises skipping the silences to save power and memory space. This is possible because the app incorporates a real-time spectrogram and a genius algorithm that make your smartphone even smarter when it comes to voice recording. It is discreet and easy to use with a recorder widget disguised as a clock. You dot even have to launch the app to start our recording your conversation. Apart from spying missions, this app has the quality of audio ideal for use in conferences and business meetings and even taking audio notes in class. This app has been praised by its users for great functionality and smoothes running with no bugs. Also with this app, you can vary the quality of audio you want to record to get exactly what you want anywhere from 8Hz to 44Hz. How would like to enjoy the ability to record top quality voice audios, voice notes, memos in the background even when your device’s screen is off? This free app will exceed your expectations offering you these capabilities and more options including saving our capture audio files in various formats. It has features similar to a voice dictation device but that does not make it over the top, it is still simple to some extent. Also, the app has inbuilt sharing feature where you can mail you recordings or upload them to Dropbox. You will find the Tape a talk voice recorder’s interface modern and intuitive while simple and clear making it incredibly easy to use. With this app, you will find it easier to record and organize your recordings than with most other apps. The app runs relatively smoothly and no major concerns about system freezing or slowing. At a glance, this app looks like your average voice recorder app with a record button where you have to hit start and stop to finish recording but look again! In addition to the regular stuff (making audio recordings and managing recordings) you can schedule a recording for any time of day for a given period. This cool feature is one of the unique features of the app that make it ideal for making recordings in your absence on your spying missions. You will appreciate the search feature with which you can easily retrieve your recordings without necessarily having to go through the entire list. This app also allows you to share your recordings via email and set them as your ringtone. While it is not the most discreet app and does not have disguises or any other of that spyware stuff, this app’s recording scheduling has made it very useful for such use. If you are looking to keep things simple, then this is one smooth app, to begin with. Are you looking for a voice recorder app that can also convert your recordings to different file types including mp3? While Mp3 is one of the most common formats high-quality audio files today, it’s a shame that most voice recorder apps do not support this format. The RecForge Lite app is a free voice recorder app with a difference. Not only does it record, edit and share top quality sounds, voices, music and other audio in several formats but also allows you to record in mono or stereo mode. While this app cannot brag to be the simplest free android voice recorder app for android, it has the most options and useful features. This app has a built-in engine that actively tries to improve the quality of sound. This is a simple voice recorder app that comes packaged with Sony phones. This app will give you simplicity and clarity in its simplest form. Before you judge the app as dull, you should check out the built-in engine for audio quality enhancement. Also, it supports microphones and can record and play your recordings – yeah that is not obvious. The benefit of using this app is that it is totally free with no in-app purchases. The downside tough is that it collects that anonymous data with a secret analytics algorithm which make freak most people out but is not big of a deal for most. Yes, the same Evernote! You can link your Evernote account to your Evernote voice recorder app. The app may not have all the clutter of features and boosters other apps contain, but the one thing unique to it is cloud storage. You can have your recordings automatically saved to your Evernote account so you can access them on the go. If you need to use more than just a few voice recordings, then this app will double as your voice recorder app while you enjoy the other features too as well as access online. This app is not over the top or dedicated to voice recording but at times keeping it simple is the key to unlocking great functionality. Whether you are looking for simplicity or a feature rich app, there is one right there for you. The ultimate best app depends on what you are looking for and the OS version you are on. More often than not the simpler apps prove to be worth a lot more than the large so over the top apps; those are often too complicated to function. In the making of this list, we tried to sample the best of the best voice recorder app for your Android device that we were certain to run smoothly on most devices. However, it is likely that some great app that you think should not have been left out. Please feel free to leave your comments on which is the best app for you or any other app you think we should know about. If you were looking for an ideal voice recorder to record meetings, memos, briefings and more, then we believe the above apps will do that nicely. Try them and let us know your thought in the comment section. There is a great IOS app called Voice Record Pro by Dayana Networks Ltd. I’m an audio mixing/mastering engineer (mostly hobby now), and this app has a GREAT meter based interface with lots of conversion and upload options. I have been trying to find an Android version with the same high quality interface and capabilities. It’s hard to find any info as to whether the same is available for Android. Does anyone know? I agree with Siren, check Dictomate out, awesome quality packed full of simple to use features, Mp3 format, first class integration with Google drive. I like Voice Recorder from RedboxSoft. It’s ads free and has no limitations. For me the best quality recording is mp3 and an app called Dictomate records in stereo at extreme high sample rate if required. There are many extra features to help me do my research and the best unexpected feature which was the bookmarking capability. Go search for it, I certainly wasn’t disappointed! I really impress by your efforts and learn a lot from your article. It is really much useful and has high quality of information. The way you enlighten everything on this article is much useful. Thanks for sharing your creative and attractive ideology with us through this post. GoTranscript voice recording app is one of the best voice/audio recorder application in Google Play. The unique feature of this application is to let you record the voice or audio and transcribe it in to text. I have tried a few free Apps which doesn’t work very well for me. Just add humans! A paid transcription service, manned by folks who are living and breathing. But it will cost you. Gotranscript apps working great! Available on Android and iOS phones. Khaled, is there any soundrecorder app that records the device’s sound OUTPUT instead of the input, running in the background? This would be needed to record audio streams from IP cams, music etc. I cannot find any.